Haas Automation, Inc is an American machine tool builder headquartered in Oxnard, California, that designs and manufactures precision machine tools and specialized accessory tooling, mostly computer numerically controlled (CNC), such as vertical machining centers and horizontal machining centers, lathes/turning centers, and rotary tables and indexers. Most of its production and manufacturing process occurs at the company's main facility in Oxnard. Haas is one of the largest machine tool builders in the world by total unit volume. Licensed under Creative Commons Attribution-Share Alike 3.0 (Habacomm). Habasit Holding Habasit Holding AG, headquartered in Reinach, Switzerland, is a Swiss manufacturer of timing and conveyor belts, including fabric-based belts, plastic modular belts and power transmission belts. The Group also supplies gears and motors. Habasit has more than 30 subsidiaries, 16 production units, and around 250 service providers and representatives in more than 70 countries. In 2013, the Group employed over 3,600 people globally, and recorded consolidated Group revenues of CHF 629.6 million. The Häfele Group (Häfele GmbH & Co KG) is a German family enterprise with its head office in Nagold, Germany. Häfele is the leading international manufacturer and supplier of furniture fittings and architectural hardware, with subsidiaries in 150 countries. Häfele's furniture fittings (hinges, drawer systems, handles, connectors, ambient lighting), architectural hardware (door hardware and electronic locking systems), and other related fittings are specifically designed for the furniture, building, and hardware supply industries. Häfele manufactures a diverse range of products from ironing boards to door closers. In the 2015 financial year the Häfele group had a turnover of 1.272 billion Euros with 37 subsidiaries in 6 continents. The turnover share abroad was 79%. The company has 7,100 employees worldwide. Hafnium is a chemical element with symbol Hf and atomic number 72. A lustrous, silvery gray, tetravalent transition metal, hafnium chemically resembles zirconium and is found in many zirconium minerals. Its existence was predicted by Dmitri Mendeleev in 1869, though it was not identified until 1923, by Dr Alexander Scott, making it the last stable element to be discovered. Hafnium is named after Hafnia, the Latin name for Copenhagen, where it was discovered. Hafnium is used in filaments and electrodes. Some semiconductor fabrication processes use its oxide for integrated circuits at 45 nm and smaller feature lengths. Some superalloys used for special applications contain hafnium in combination with niobium, titanium, or tungsten. Hafnium's large neutron capture cross-section makes it a good material for neutron absorption in control rods in nuclear power plants, but at the same time requires that it be removed from the neutron-transparent corrosion-resistant zirconium alloys used in nuclear reactors. The Hahnenkamm is a mountain in Europe, directly southwest of Kitzbühel in the Kitzbühel Alps of Austria. The elevation of its summit is 1,712 metres (5,617 ft) above sea level. The Hahnenkamm (German: rooster's comb) is part of the ski resort of Kitzbühel, and hosts the annual World Cup alpine ski races, the Hahnenkammrennen. The most famous slope on the Hahnenkamm is the classic downhill course, the Streif (streak, or stripe), which is regarded as the most demanding race course on the World Cup circuit. The course features highly technical, "fall-away" turns (reverse bank), many with limited visibility. It also contains several flat gliding sections, immediately preceded by difficult turns, placing a premium on both technical and gliding skills. A run on the mountain's northeast face, the Streif course, is mostly in the shade in January. It is usually overcast and coupled with fog, the result being "flat" lighting which compounds the course's difficulty. Licensed under Creative Commons Attribution-Share Alike 4.0 (Haier Group). Haier Group Corporation is a Chinese collective multinational consumer electronics and home appliances company headquartered in Qingdao, Shandong province, China. It designs, develops, manufactures and sells products including air conditioners, mobile phones, computers, microwave ovens, washing machines, refrigerators, and televisions. According to data released by Euromonitor in 2014, the Haier brand had the world's largest market share in white goods, with 10.2 per cent retail volume market share. This was the sixth consecutive year in which Haier had been the market share leader for major appliances.Haier Group also consisted of two listed subsidiaries: Qingdao Haier Co., Ltd. (SSE: 600690) and Haier Electronics Group Co., Ltd. (SEHK: 1169). It was announced that Qingdao Haier would also issue "D-share" to trade in China Europe International Exchange of Frankfurt. Licensed under Creative Commons Attribution 2.5 (Alan J Truhan - Ajtruhan (talk) (Uploads)). A hair clipper (often individually known by the apparent plural hair clippers in a similar way to scissors) is a specialised implement used to cut human head hair. They work on the same principle as scissors, but are distinct from scissors themselves and razors. Similar but heavier-duty implements are used to shear sheep, but are called handpieces or machine shears. A Hall effect sensor is a transducer that varies its output voltage in response to a magnetic field. Hall effect sensors are used for proximity switching, positioning, speed detection, and current sensing applications. In a hall-effect sensor a thin strip of metal has a current applied along it, in the presence of a magnetic field the electrons are deflected towards one edge of the metal strip, producing a voltage gradient across the short-side of the strip (perpendicular to the feed current). Inductive sensors are just a coil of wire, in the presence of a changing magnetic field a current will be induced in the coil, producing a voltage at its output. Hall effect sensors have the advantage that they can detect static (non-changing) magnetic fields. In its simplest form, the sensor operates as an analog transducer, directly returning a voltage. With a known magnetic field, its distance from the Hall plate can be determined. Using groups of sensors, the relative position of the magnet can be deduced. Frequently, a Hall sensor is combined with threshold detection so that it acts as and is called a switch. Commonly seen in industrial applications such as the pictured pneumatic cylinder, they are also used in consumer equipment; for example some computer printers use them to detect missing paper and open covers. They can also be used in computer keyboards applications that require ultra-high reliability. Hall sensors are commonly used to time the speed of wheels and shafts, such as for internal combustion engine ignition timing, tachometers and anti-lock braking systems. They are used in brushless DC electric motors to detect the position of the permanent magnet. In the pictured wheel with two equally spaced magnets, the voltage from the sensor will peak twice for each revolution. This arrangement is commonly used to regulate the speed of disk drives. Licensed under Creative Commons Attribution-Share Alike 2.5 (Toby Ord). 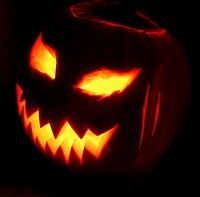 Halloween or Hallowe'en (a contraction of Hallows' Even or Hallows' Evening), also known as Allhalloween, All Hallows' Eve, or All Saints' Eve, is a celebration observed in a number of countries on 31 October, the eve of the Western Christian feast of All Hallows' Day. It begins the three-day observance of Allhallowtide, the time in the liturgical year dedicated to remembering the dead, including saints (hallows), martyrs, and all the faithful departed.It is widely believed that many Halloween traditions originated from ancient Celtic harvest festivals, particularly the Gaelic festival Samhain; that such festivals may have had pagan roots; and that Samhain itself was Christianized as Halloween by the early Church. Some believe, however, that Halloween began solely as a Christian holiday, separate from ancient festivals like Samhain.Halloween activities include trick-or-treating (or the related guising), attending Halloween costume parties, carving pumpkins into jack-o'-lanterns, lighting bonfires, apple bobbing, divination games, playing pranks, visiting haunted attractions, telling scary stories, and watching horror films. In many parts of the world, the Christian religious observances of All Hallows' Eve, including attending church services and lighting candles on the graves of the dead, remain popular, although elsewhere it is a more commercial and secular celebration. Some Christians historically abstained from meat on All Hallows' Eve, a tradition reflected in the eating of certain vegetarian foods on this vigil day, including apples, potato pancakes, and soul cakes.